The heatwave continues but our water level at Chew is still remarkably good – there was plenty of water for the Round the Island Race last weekend – but the weed is once again becoming a force to be reckoned with! 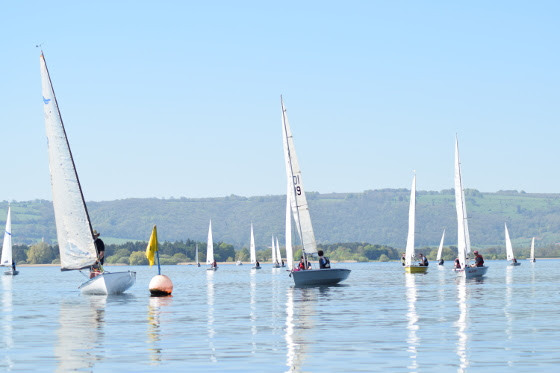 The ladies Trophy Race was on a gloriously sunny afternoon, and some brilliant sailing took place as the ladies competed in 3 races with shifty and gusty winds. The first place and winner of the Trophy was Cathy Bartram, who was starting well and sailing consistently in her Aero. Christi Brasher came a close second in a Laser winning the last race, and (Prof) Jan Frayne came third in her Laser. Special mention goes to Sue Wingrove who is new to helming this year and entered the race determined to master her Laser Radial. The next Lake & Cake sail & get-together is on Saturday 04-Aug-18 – meet in the bar at 1:45 rigged & ready. Steve Morris Trophy Race – 33 boats contested this handicap race which was also the first of the Admirals Chase series. Steve Jones was the winner in his RS 100. In second place, making a most welcome return to the Club was his nephew, Ed Jones, also in an RS 100, and in third were Paul and Harry Smalley in their Mirror. Family Regatta – this has always been one of the busiest and most popular days at the Club. Once again, the sun shone and the wind occasionally obliged with a small breath. At least 35 boats completed the circumnavigation of Denny Island, mostly with enthusiastic crews of young pirates and some dressed with flags and bunting. First to emerge was the Clapham Aero before a brace of battling Wayfarers. (One was paddling, the other rowing – the paddlers realised that the old Hornblower tactic against galleys was the best bet – get in close and disrupt the oars!). Herculean efforts by Hugh Whatley, Mike Meloy and Jeff Stratford and his troops had cleared the paths from the harbour on the far side of the Island. So, after the traditional pirate parade and awarding of prizes, it was off to the island to hunt for pirate treasure. Gill’s Seek and Find quiz kept everyone occupied between-times with many learning lots about what is at the Club, and where it may be kept! Remarkably a new-member family, the Blanks-Waldens, won with the only completely correct answer sheet! Finally, need I mention our amazing footy team rounding the day off nicely as we all enjoyed the BBQ!! Racing Regatta – I think the weeks of light and fickle winds have knocked the spirit out of the regular racers meaning numbers were depleted for the racing regatta. Shame, because three of our nicest cups were up for grabs. In the morning the ‘A’ handicap cup was won by Colin Evans in his Finn, and the ‘B’ handicap cup was retained by Alex Timms in his Solo. The pursuit race in the afternoon for the Marshall Trophy produced a nail biting finale. Sadly, having lead for most of the race, the Nicholls Mirror was swallowed up by the pack with 10 minutes still to go. Bill Chard in a borrowed Solo, followed by Dave Oakey, also in a Solo, hung on by a hair’s breadth from Colin catching in the Finn when the final hoot sounded. Thursday Start Racing – The “Start Racing” sessions are now complete and have been a big success. The five Thursday evenings have been blessed by near perfect conditions and attracted a range of boats, mainly Lasers, some Toppers and a sprinkling of double-handers, including sailors with a wide range of experience, all keen to get stuck in. The sessions are intended to provide a bit of a leg-up for any existing sailors looking to give racing a try. Each week covered a different topic from starting, mark rounding, getting extra speed out of the boat, upwind tactics, boat handling and lots more. There was bags of time on the water, with practice starts and short races, and then lots of discussion and chat over a pint in the bar afterwards. So we now have a group of sailors eager to hit the racecourse…. those regular racers amongst us, please look out for any new faces and be available to lend a hand or offer advice as required. Fun Thursdays – 12-Jul-18, 09-Aug-18 and 30-Aug-18. 14.00 onwards… Our Police Group are manning the Club on these days to give their members some race training and a fun race or races at the end of each afternoon. Jeff Stratford has offered to cover Club safety for everyone from 14.00 each day. You are then welcome to join in their fun races. There should be a ‘brief’ briefing for these at around 5.30pm. Finally they plan to have the BBQ going at days end and anyone bringing their own food is welcome to share the heat! Wednesday Evening Series – continues throughout July. Come along, if only for Rob’s great curries at the end! Admirals Chase Series – Sunday mornings all-in handicap race series for one of the finest trophies at the Club. We entered the round the island race last Saturday during the Family Regatta. It was only by chance that our Commodore – Helen emailed suggesting that paddles may be helpful; so I had a look round the garage on our way out to the club and picked up two planks of wood. All I can say is ‘thank you’ Helen as we happily paddled past you going nowhere in the stillness of summer. Physically we came fourth but the handicap system pulled us out of the placings. We would like to express our thanks to John and the duty team for a great day enjoyed by all. Now that you all know who we are, and what Boaty McBoatface looks like, please make yourselves known to us on or off the water. Either to say hello or make suggestions on any activities or topics that you would like to discuss that we can take forward to the sailing committee. Looking at the calendar we notice that the 18-Aug-18 is blank so what about all those cruising sailors coming on down for a day leisurely sailing round the lake followed by a social in the club house mid-afternoon? Saturday always presents plenty of clear water to enjoy. If you have not already got an RYA Powerboat Level 2 qualification, (this is the basis of all powerboat use in the country), you can do this 2 day course at Chew. There are 2 vacancies on the course planned for 04-Aug-18 and 11-Aug-18. Additionally, the Club is offering a one day supplement to this to teach the skills actually required as you try to rescue people and their dinghies from the water. There are vacancies on the course on 20-Oct-18. Finally, Jeff Stratford has also offered to give current RBHs a 1-2 hour update on use of the RIBs before their duty. First Aid – members should be aware that our First Aid locations have changed and contents of kits updated, thanks to Chris & Ann Platts for their help with this. The 2 Main kits can be found above the duties desk and in the training room, an additional kit is located with the stretcher in the Boat Store. The Defibrillator has moved and is now located above the duties desk. Should First Aid be required be required the clubs radios should be used to speed access to those arriving at the casualty site. Please be aware that it is a club rule and a safety measure that no one sails unless the duties team are flying the club flag from the main flag pole. John Smalley – Vice Commodore.